Officers in protective suits in London Road cemetery. 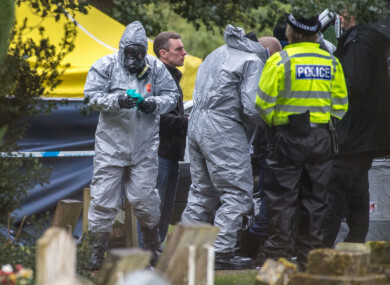 UK HOME SECRETARY Amber Rudd has said that the investigation into the poisoning of a Russian ex-spy in Salisbury is moving “at speed”, having identified more than 200 witnesses already. Rudd was speaking following an emergency meeting of the British national emergencies committee Cobra, convened in response to the 4 March attack. Some 21 people were injured in the incident which took place in the south-west of Salisbury where Sergei Skripal was found last Sunday, slumped on a bench with his daughter Yulia. She added that it was too early to comment on potential suspects, as the investigation is “painstaking” and “detailed”. Security Minister Ben Wallace told BBC radio today that the government stood ready to respond “with the full force of the UK’s resources”. He added that the attack was “a very serious incident with horrendous outcomes”. “Someone has come onto our soil… has recklessly, brazenly, committed what looks like a very nasty crime, with a nerve agent prohibited, by most international laws… and has potentially put lots of people at risk,” he said. May was “expected to announce sanctions” against Russia “as soon as Monday”, according to the Daily Telegraph newspaper. The Times newspaper said British officials were talking to their US and European counterparts about a co-ordinated retaliation, which could include “diplomatic, economic and military measures” if Moscow was behind the attack. The police officer who was injured with a nerve agent while attending to Sergei and Yulia Skripal, meanwhile, has denied he’s a hero. A statement on behalf of Sergeant Nick Bailey said: “Nick would like us to say on his behalf that he and his family are hugely grateful for all the messages of support from the public, and colleagues from the police family. He also wishes to say that he was part of a group of officers and other emergency service colleagues who dealt with the initial incident. He wants to say that he does not consider himself a ‘hero’, he states he was merely doing his job – a job he loves and is immensely proud of – just like all of his other dedicated colleagues do, day in-day out, in order to protect the public and keep people safe. Wiltshire Police also said that the graveyard where the incident took place will remain closed for Mother’s Day. Email “More than 200 witnesses identified in probe into poisoning of Russian ex-spy in UK”. Feedback on “More than 200 witnesses identified in probe into poisoning of Russian ex-spy in UK”.